Alpha Omega Epsilon is a professional and social sorority for female engineers, founded on November 13, 1983 at Marquette University. Today, Alpha Omega Epsilon spans across the United States and throughout several parts of Canada. The Sisters of Alpha Omega Epsilon promote ideals and objectives that further the advancement of female engineers. The sorority strives to create the ideal environment to form lifelong friendships while promoting scholarship, philanthropy, leadership, and professionalism. Not only does Alpha Omega Epsilon promote these broader concepts, but the sorority also aims to foster individual growth and self-worth. Being a member provides each Sister with unique industry and professional opportunities that would not otherwise be realized. The sisters are always looking for new members that will help carry on the proud traditions and principles that have shaped this sorority for so many years. Our growth and future lies in the new members we recruit. Still building a strong foundation, the University of Maryland Colony was founded on September 17, 2005. 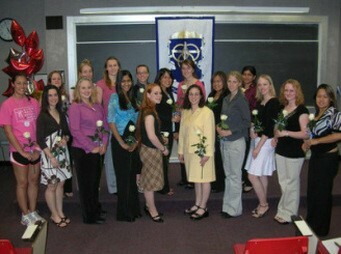 The Upsilon Chapter was established in Spring 2006. The sisters are avid promoters of friendship, leadership, individual growth, and professionalism to all members of the organization, the community, and the professional world. Alpha Omega Epsilon provides many opportunities for involvement to help strengthen the roots of the chapter. Upsilon abides by the ideals and objectives set by the International Board. Formed with only fourteen girls, the chapter now has over seventy actives and is continuing to expand. Active in the A. James Clark School of Engineering, the chapter participates in engineering related activities such as the Engineering Fall Picnic, E-Week in the spring, and intramurals. As an individual, I will promote integrity, character,honesty, self-confidence, and uphold my financial responsibilities. As a sorority, we will promote unity, friendship, professionalism, follow traditions, and maintain our image. As an integral part of the school, we will promote engineering activities, high scholastic standards, and strong relations between students and faculty. As an active member in the community, we will promote understanding, knowledge, and communication within our profession. · To work for the betterment of the individual and the Sorority as a whole. · To create a friendly and warm environment among its members. · To promote the welfare and interest of the profession. · To strengthen the relationships between students and faculty. · To enhance educational achievements and scholarship. · To help develop the highest standards of personal integrity and character. · To foster and maintain the bond of sisterhood through a continuing program for the alumnae.